Where is God in the middle of my hopelessness? Well… I truly believe He’s one of the only ones I can say 100% is walking along side of me. He knows my struggles and He knows my pain. Lately, it’s taken everything in my to just get through day to day life, let alone be online engaging in any communication or conversation. I had to withdraw. For many reasons. Many of my blog followers and a few of my close friends knew about my journey to present my DNA connection to my biological father to once and for all prove I’m His daughter. You can read about it here Delivering the DNA results with grace. I’m briefly catching everyone up with an update. Well there really is no update. After all Father Felix shared with me he has stopped responding to my emails and I haven’t heard one word from Him sense March 5th. Just like that… The one and only Hope I had in my Birth Father changing his mind and maybe wanting to get to know me is OVER. Just like the snap of a finger. Over the last few months my hope has diminished to nothing. I can’t help but come to a place of acceptance in order to be able to move forward with my life but it has been the most sorrow I think I have yet to experience regarding my adoptee journey. If everyone thinks the cute little baby you adopt won’t have lifelong grief, loss and trauma they are wrong. I am 4 1 years old and some days the pain is too much to get me out of bed in the am..
Because of God I am here. The part that is SO HARD for me is that PEOPLE are so QUICK to SPEAK WORDS and they don’t follow through. I DON’T NEED ANY MORE BULLSHITTERS and LIERS in my life! What has this done for me? Made me feel like everyone in the world is just full of it. Anytime someone says something I make a mental note that says, “Let’s see if their actions line up with their words!”. Extremely hurt deep down and trying to pick up the pieces of what I find to be the last chance of ever meeting my biological grandmother. Of ever having one memory with her. Of ever hearing about her life. This is IT for me to ever be able to make any memories with any of my family on my biological fathers side. This is IT for ever being able to celebrate their lives with them and hear about their childhoods and what their life was like growing up. This is IT to ever feel that sense of belonging, the one only DNA connections can provide with any of my biological family. I have felt extremely guilty for coming with a message that is filled with pain. I have felt I have to always bring a message of HOPE for my fellow adoptees. That is why I haven’t said much at all and that is part of the reason I got off Facebook. I just can’t handle the external weight that comes with being on Facebook right now. But I won’t. It’s nothing anyone would understand unless they have gone through it. Today, I am thankful I have my kids because without them I would not be here. Thank God for my relationship with Him, because although I feel like the world has failed me, He has not. He’s been along side of me helping me put one foot in front of the other. I will be approaching my 42nd “Birth”day which is dooms day for me. Think about that day, and what happened that day! There is nothing to smile about for me. No not even LIFE! I have prayed and prayed for God to help me celebrate this day and I just can’t. But I will do my best to put on a smile for those I might see. My sobriety birthday of 4 years is also coming up. That’s def something to celebrate but the pain to go along with being a sober adoptee.. It’s been the hardest 4 years of my life!!!! 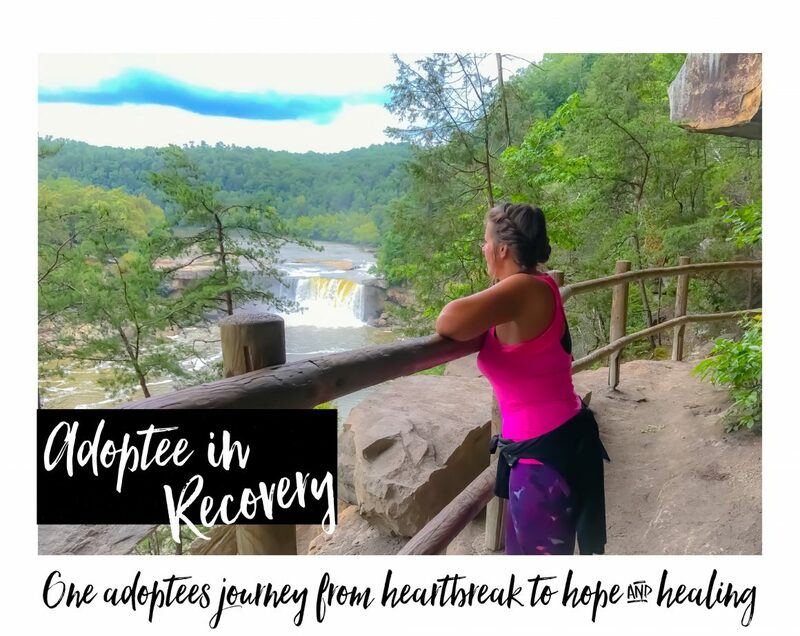 But I wouldn’t change my recovery journey for anything. My kids deserve a happy healthy mom and my future grandkids deserve a happy healthy grandmother!